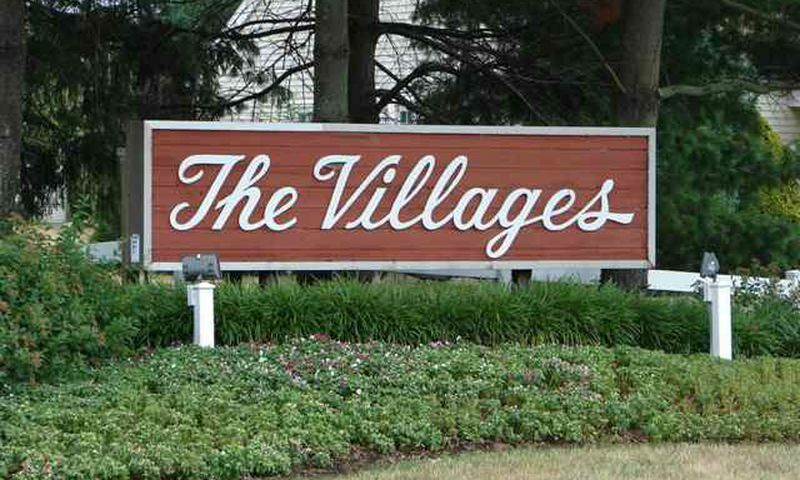 The Villages in Howell, New Jersey is an age-restricted community in Monmouth County. It offers affordable homes with low taxes and maintenance fees. This quiet community is perfect for adults 55 and better who are looking for a decent home in an established neighborhood. The Villages features beautiful landscaping and is the perfect place to call home for active retirees wanting to stay close to family. This peaceful resale community is comprised of 670 attached ranch homes. The type of ownership is the same as for condos. Homeowners are conveniently located close to stores, restaurants, medical facilities and several transportation options including bus service to vibrant New York City. Residents can also utilize the free community bus service for local shopping excursions. This active adult community was developed between 1967 and 1975. All homes are attached ranch models with one or two bedrooms. Most units are attached in groupings of two to four units per building. All homes at The Villages in Howell have central air, electric heat, and large yards. The monthly maintenance fees are low and include use of the clubhouse, landscaping of common grounds, snow removal, exterior maintenance, termite and pest control, shopping bus service, and trash removal. The exterior maintenance includes repairs to roofs and gutters. Homeowners are responsible for all interior maintenance and repairs. Homeowners love living in an affordable and low-maintenance community for active retirees looking for an easy lifestyle. Owners in this traditional and established community take pride in their homes. The community grounds are beautifully landscaped, and peace and serenity reign. Residents are active in a variety of social clubs and there are plenty of planned activities and trips throughout the year. Some of the popular clubs and activities include bingo, ceramics, dancing, yoga, and much more. The community also plans holiday parties and day trips for residents to enjoy. People in this community are warm and friendly and welcome new neighbors with open arms. The Villages in New Jersey is located on the east of Route 9 in the northern end of Howell on the Freehold Township border. There is a Walgreens pharmacy, food market, and Dunkin Donuts nearby. Residents also have easy access to Central State Hospital, Battleground State Park, the Freehold Mall, and Freehold Raceway. Besides malls, Monmouth County also has an assortment of flea markets, arts and crafts stores, and antique shops for a unique shopping experience. Sun lovers and water sports enthusiasts will enjoy the close proximity of the Jersey Shore. Gateway National Recreation Area and Sandy Hook Gateway Recreation Area offer miles of beaches and dune trails. A 45-minute drive will take residents to exciting Atlantic City which also has an international airport for convenient long-distance travel. With affordable homes, a vibrant lifestyle and top-notch amenities in a desirable location it is easy to see why The Villages is a popular retirement community in New Jersey. There are plenty of activities available in The Villages NJ. Here is a sample of some of the clubs, activities and classes offered here. All homes are attached ranch models with one or two bedrooms and one or two bathrooms. Most units are attached in groupings of two to four units per building with a total of 165 buildings. One model is available only with a garage, while the other five models come with an optional garage. All homes at The Villages have central air, electric heat, and large yards. The monthly maintenance fees are low and include use of the clubhouse, landscaping of common grounds, snow removal, exterior maintenance, termite and pest control, shopping bus service, and trash removal. The exterior maintenance includes repairs to roofs and gutters. Homeowners are responsible for all interior maintenance and repairs. Living here for almost 5 years and have noticed that the entire community seems to be heading in the wrong direction it is becoming badly run down thru out. Very sad especially the entire club house area including the pool area and the gym room is filthy. What is going on !!!!! I am living in the Villages for almost 11 years, the board works very hard to do things to make the Villages a great place to live. If you need your gutters fixed, windows painted, driveways paved, roofs taken care of etc. they do it. Other developments you have to do it yourself. These are some of things our maintenance fee takes care of. The fee go up a very small amount compare to what they do. There are always people that complain and should live in Greenbriar or the Rivia where it is prettier and you have complete control of your house. You can fix it any time you want to pay for it. The HOA at the villages is horrible, It took us almost 2 years to get them to sod our lawn in just one small area. More excuses and more than I can count of the number of requests, both written and verbal. The fees go up every year. And they do not make the increase change for you, they make you figure out how to do it yourself.No other association operates this way. The dues are way to high for what you pay for compared to other more expensive communities. 55places.com is not affiliated with the developer(s) or homeowners association of The Villages NJ. The information you submit is distributed to a 55places.com Partner Agent, who is a licensed real estate agent. The information regarding The Villages NJ has not been verified or approved by the developer or homeowners association. Please verify all information prior to purchasing. 55places.com is not responsible for any errors regarding the information displayed on this website.